We are located approximately 50 miles north of Indianapolis in western Howard County. The goal for our small herd of French Alpines is excellence both in linear appraisal and in milk production. We participate in DHIR and the American Dairy Goat Association Linear Appraisal programs as tools to help us achieve this goal. We have had many does earn their Advanced Registry, appraise EX and to date, we have had eight does earn their Superior Genetics designation. Our herd has tested CAE negative since we began whole-herd testing in October 2010. Our latest test was in February 2017. We had raised kids on heat-treated colostrum and pasteurized milk for 15 years, but due to our CAE negative status, we have begun to feed raw milk. Our herd is also abscess-free. 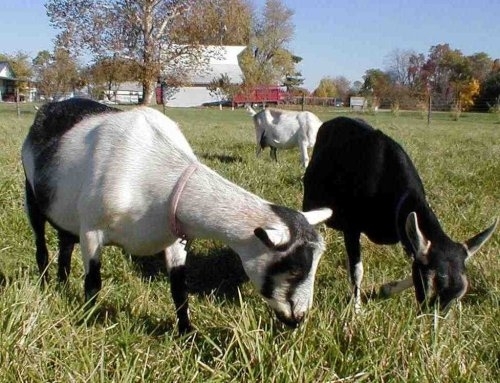 If a person who has paid a deposit to hold a goat(s) does not pick up the goat(s) in the agreed upon time frame, and does not respond to inquiries by Sycamore Acres via email, phone, or text, said person will forfeit the deposit and the goat(s) will be considered available to another buyer. One may reserve a kid yet to be born by submitting a non-refundable* deposit of $50. Please give us a first and second choice. The balance is due at pick up and must be paid with either cash or money order. The purchaser has three weeks from the day the kid is born in which to pick it up. A $3.00/day boarding fee will be applied after the three week period. We reserve the right to retain any kid. * If we are unable to fulfull your order or we decide to retain the kid in our herd, we will refund your $50 deposit. We have for sale our farm fresh brown and green chicken eggs. Our hens are fed a high-quality diet that includes grains, seeds and vegetation. The chicken hens have all the raw goat milk they care to drink for most of the year. They also have access to the outdoors at all times. We also sell various goat-related items in our Goat Goodies section. Included are our handcrafted goat milk soaps, all-natural udder oil, goat greeting and Christmas cards, 8X10 breed prints, a dairy goat stamp-motif poster, and goatie Christmas ornaments and magnets crafted from poplar wood.